Caring young people with drive, ambition and a passion for making a difference to people’s lives are being invited to attend a unique careers advice fair in Oxford next month. More than 6,000 people come to work at Oxford Health every day providing physical, mental health and social care across the Thames Valley and beyond. Now, as part of National Careers Week, we want to encourage more young people aged 16-24 to ‘Work With Us’ and consider a career in the NHS. 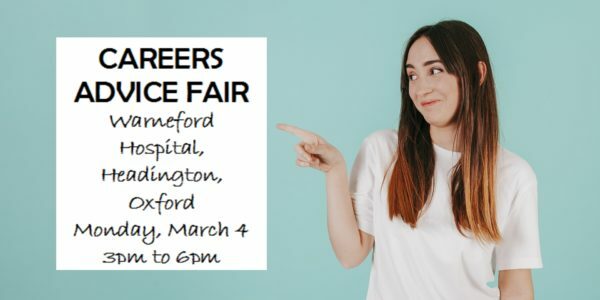 The trust is holding a special careers advice day on Monday, March 4 from 3pm to 6pm at the Warneford Hospital in Headington, Oxford. Come along to the main reception after school or college and meet a host of frontline staff representing mental and physical nursing, dentistry, podiatry, dietetics, pharmacy, business administration and occupational therapy among others. There’ll be representatives from Oxford Brookes and Activate Learning too – all on hand to give careers information and advice. With so many different careers on offer in the NHS, there are many opportunities for young people no matter what their interests, skills or qualifications. Tim Boylin, Director of Human Resources at the Trust, said: “Our amazing staff are involved in an array of jobs in mental, physical and community health across Buckinghamshire, Oxfordshire, parts of Wiltshire and Somerset each and every day. “We take great pride in them and believe that investing in our dedicated workforce is critical to achieving our vision of outstanding care delivered by outstanding people. “We also know that today’s young people are tomorrow’s mental health professionals and we have a duty to encourage and stimulate their imaginations about the endless opportunities on offer. Looking for a role now? Oxford Health works with a wide range of partner organisations to deliver care and support to people in their own homes and from several hospitals and community bases. There are some exciting roles currently advertised on the trust website that may appeal to young people. Health care assistants are needed in community hospitals at Abingdon, Bicester, Oxford City, Didcot, Wallingford and Witney helping to deliver excellent care to our patients who are with us for short stay rehabilitation following a fall, operation, infection or are in the Oxfordshire Stroke Rehabilitation Unit at Abingdon Hospital. We are also recruiting for nursing associate trainees – newly created roles across mental health, forensics, learning disability and community physical health work. It allows people to train as they earn. Applicants attend a course one day a week as part of an apprenticeship while working in a service area four days a week with the support of a work-based tutor. Each pay up to £20,488; offer 27 days annual leave, plus bank holidays; NHS staff discounts at a wide range of shops, restaurants and leisure facilities; and a cycle to work scheme.